Growing Charley's Vegetables and Herbs for great tasting garden vegetables. Description: Just as it’s name suggests, Big Bertha Bell Peppers produce large, 7in long fruit in about 72 days. They have thick walls and turn bright red when left to fully mature on the vine. These peppers are great for stuffing or slicing and eating raw. Being sensitive to the cold, planting should be delayed until the danger of frost is past in the spring. Ideal temperatures are 70 to 80 degrees F during the day, and 60 to 70 degrees F at night. Usually, the plants set satisfactory crops when temperatures are between 65 and 80 degrees F and the soil is well-supplied with moisture. Avoid a soggy, water-logged soil condition when growing peppers. Height: Grows 3′ to 5′ tall. Outstanding Features: Tolerant of Tobamo Po virus. Tips: Water plants thoroughly after transplanting. Avoid planting under conditions that will stunt the plants and lead to poor production, such as cold weather, lack of sufficient soil moisture, or lack of sufficient fertilizer. Water deeply but not too often. 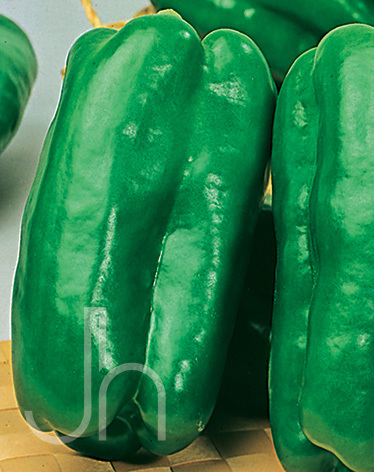 Click here to buy Big Bertha Green Bell Peppers direct from www.buygardenvegetables.com.